I picked this fiber up at the DFW Fiber Fest 2013. It’s Whirligig, which is 4 oz of Superwash Merino from Gritty Knits. I love it, love it, love it! These are my kind of colours: orange, pinks, magenta, red, and a little bit of white. It’s bright and fun. This was actually some of the first fiber I ever spun on my wheel, so it’s extra special to me, even though it’s extremely uneven (or maybe because of it). It’s no particular pattern or anything, but I really enjoyed working on it and can’t wait to wear it. But that’s not all my needles have been up to! 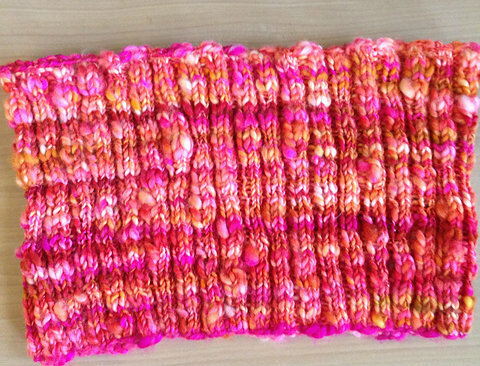 I also finished a large cowl in Red Heart’s Vivid Yarn in the Crazy Coral colorway (pictures to come once the ends are woven in). I finished my shawl (pictured below) for the WendyKnits Summer Mystery Shawl 2014 by Wendy D. Johnson on time, though I hadn’t gotten around to taking pictures and sharing them here right away. I also finished yet another pair of Sport Weight Toe-Up Socks with Gusset Heel (5/15/07) by Wendy D. Johnson, made for my husband. They were technically for me, but they fit him a lot better, so he’s adopting them. I also added a few new items (or am about to add) to my project list. Yesterday I cast-on Hermione’s Everyday Socks by Erica Lueder. I tend to stick to toe-up socks (as evidenced by the number of times I’ve knit Wendy D. Johnson’s toe-up sock pattern), but I really wanted to try this pattern out. I’ve been reading the Harry Potter books lately, and I thought these would be fun to work on while reading during my lunch break. So far, I love how easy the pattern is to follow and memorise. 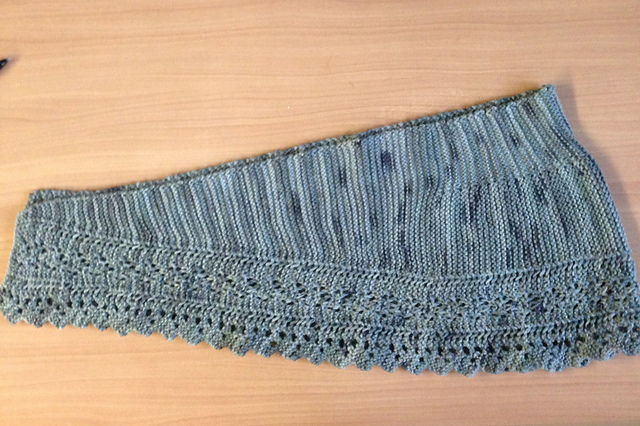 The other big project I’m about to get started on hopefully today is the Meridian sweater by Cecily Glowik MacDonald. It was love at first sight with this sweater. How much love? I swatched, y’all. Seriously. I know in the intro series I tried to impress upon the importance of swatching, but let me be honest with you. I never do it. I’ve experimented enough to know that I typically have to drop 2 needle sizes for whatever project I’m working on. It’s something I just don’t take the time to do, and I very rarely regret it. However, when I opened the pattern and saw that the suggested needle size was a 10 on worsted weight yarn, I knew I had better put in the work. Even a size 8 on worsted is huge for me. I’m a loose knitter. To say I’m glad I took the time this go around is an understatement. I just measured my swatches (once yesterday before blocking and now after they’d dried), and I’m going to be dropping 4 needle sizes to get gauge. No joke. I’ll be doing my sweater on size 6. There are, of course, a couple of projects languishing and in dire need of some attention (my Theoden Socks by Claire Ellen, my Ellington Socks by Cookie A, and the long overdue An Aran for Frederick by Kathleen Dames, all of which are amazing patterns), but I honestly think I’ll be casting on my sweater today. It’s calling to me! I’ve shrunk out of the sweater I made for myself last fall, and I’m dying to add a cardigan to my wardrobe. Eventually I’ll get back to the other projects (I hope). What projects are you working on? Any languishing like mine? I have 3 projects on my needles. One is a beaded shawl which is half way finished and the second is a baby kimono for my friends newborn son. My 3rd is a lace scarf. I never swatch either…glad to hear I’m not the only one. I’ve just pulled myself out of a knitting funk too – I have a baby cardigan on my needles at the moment. Those are my kinds of colours too. So happy and cheerful in pinks and reds. Dropping FOUR needle sizes?! Wow! I am lucky in that I am a textbook tension knitter. I make swatches if I feel I need to check how something will work, such as a new-to-me technique, but I don’t if I think the pattern is straightforward.